Isn’t this one of the most adorable pigs you ever saw?! This footprint pig and handprint chicken are a great farm animal craft! 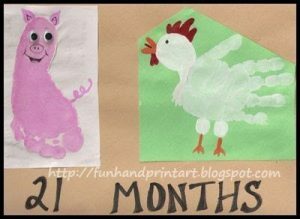 To make the footprint pig, paint the child’s foot pink and press onto the paper. Then, paint on ears and a curly tail. When dry, draw on facial features (I used googly eyes instead of drawing the eyes on). 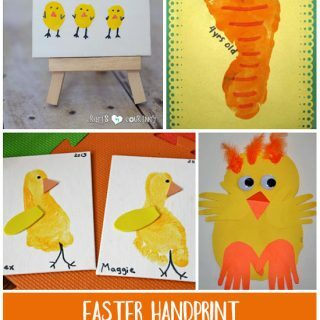 For the handprint chicken, paint the hand white, press onto the paper, and wait for it to dry. After the handprint dries, paint on the white part of the legs and a white head – don’t forget to add a short neck. Then, paint on orange legs and a beak. Lastly, paint on the red under the beak and the tongue. 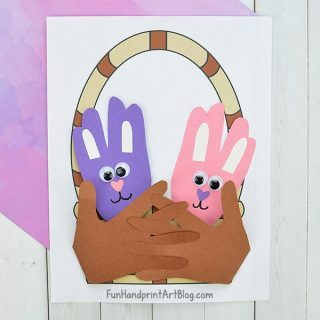 Hey, I found you through Creative Moms in the Circle of Moms on Facebook, and wanted to tell you how much I love all of these handprint and footprint projects you’ve done with your child(ren?). Inspired, I stopped my 19 month old from squishing paint in her hand just long enough to do this: She loved playing with the paint. Well, thank you! =) You are pretty awesome yourself. I don&#39;t think I could ever think up this much to do with hand or footprints! I totally stalk your blog now. LOL I&#39;ll have to set up Alice&#39;s little art gallery for you to see the fingerprint/handprint/footprint stuff she&#39;s done.